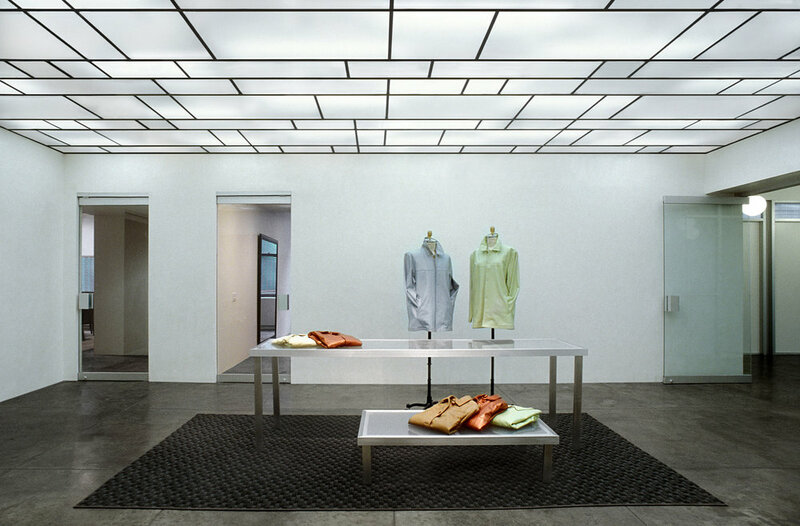 A central plaza with a luminous ceiling marks the village center for a complex of showrooms and design studios in the heart of the Garment District. The center square, in line with the entry, welcomes the buyer with displays and featured merchandize directing attention to the various collections on display and providing access to each showroom with its own branded decor. Past the piazza, the offices and studios in the loft like space are defined by a translucent glass and aluminum wall. The wall lets in light to the work areas and aligns the offices much like boutiques on a shopping street. Cobalt blue, bright yellow and lime contrast with a neutral palette in the public areas and draw attention to bold architectural features such as columns and curved walls that define the space.